This unique compilation focuses on a very curious organ, the ovary. There are still many unknown facts about the origins of ovarian tissue and ovarian cancer, and each chapter describes in detail the latest insights into the ovary from basic to clinical aspects. Expert authors reveal the most recent findings on ovariogenesis and ovarian carcinogenesis by shedding light on stem cell biology for the ovarian surface epithelial cells or primordial germ cells. 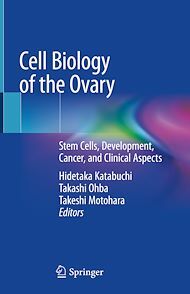 Readers will greatly increase their understanding of the relevance of the cells that constitute the ovary, which is of vast significance in comprehending the occurrence mechanism of ovarian tissue and ovarian cancer. In this way the book covers a wide range of fields concerned with the ovary. This work benefits not only gynecologists and obstetricians, but also basic researchers in the field of stem cell biology and all clinicians who are involved in the management of fertility preservation or ovarian cancer.